Obviously I enjoy cooking, but I really hate the pressure of having to cook every evening after work. I want something tasty, satisfying and simple to serve the family. This dish ticks all those boxes. It is easily thrown together, then placed in the oven and forgotten about until it is time to eat. This recipe gives me an extra 30 minutes to do other things while it works its magic in the oven. To add to the simplicity of this meal, I cook up either some straight rice or a mixed grain/rice combination, and then add a few salad greens on the side. 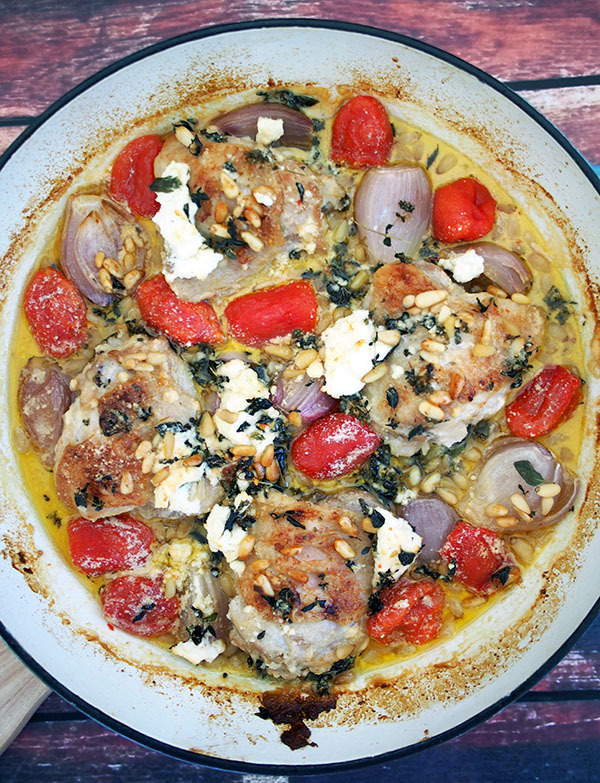 The tomatoes break down, juices from the chicken are released and the feta melts slightly creating a delicious sauce. If you couldn’t be bothered with the rice, some crunchy baguette wouldn’t go astray. I like serving this dish with something that you can mop up the sauce created during cooking, the sauce is plate licking worthy. I find that chicken thigh works best, as chicken fillets tend to dry out slightly. You could also use a combination of chicken pieces if you preferred, legs, thighs and wings. If you wish to remove the skin you can, but I leave it on to help keep the chicken pieces moist and to add extra flavor. You can also use boneless cuts of chicken, but again the bone adds flavor when cooking. Easy dish to whip up after work. Perfect for the whole family. Preheat oven at 180 degrees Celsius (160 fan forced). Heat olive oil in a stovetop to oven suitable pan or baking dish. Add chicken thigh fillets and brown well chicken on both sides well. Remove chicken thighs from the pan/baking dish and set aside. Deglaze you pan with the white wine. Making sure to scrape up all the caramelized brown bits on the bottom on the pan/dish. Remove pan/dish from heat. Place chicken back in your pan/dish. 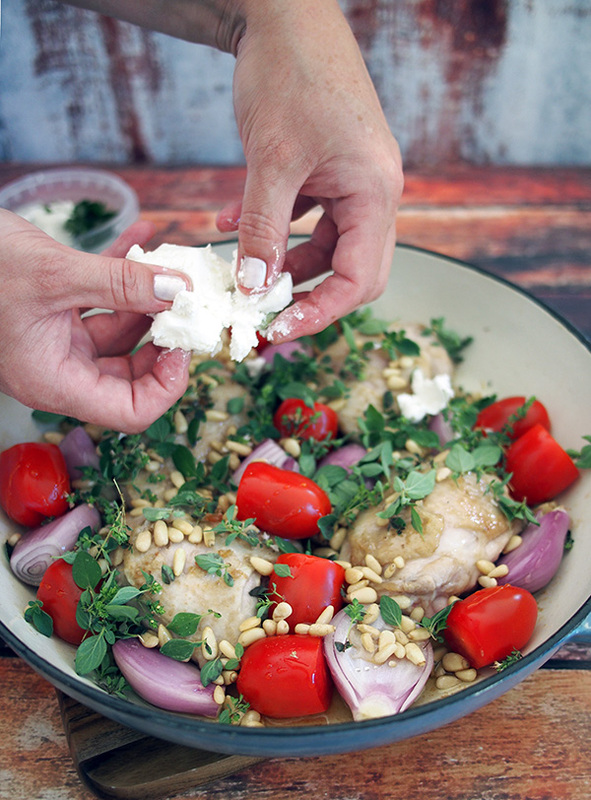 Place eshallots and tomatoes around the chicken, then scatter oregano, pine nuts and feta on top. Then drizzle over your honey. Place pan/dish in your pre-heated oven and cook for a further 35/45 minutes until the chicken has cooked through. 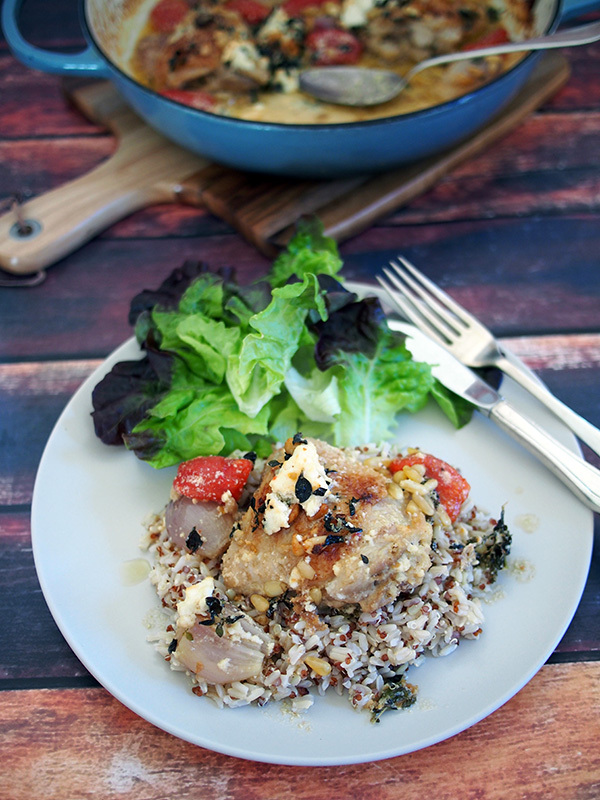 Serve with mixed grains or salad and crunchy bread. Do tell dear Belly Rumbles’ reader, are you a slave to the kitchen when you get home from work? Looks delicious and indeed easy, thanks for the recipe! I too try to make easy recipes during the week and leave the time-consuming ones for weekends. What a wonderful easy recipe! I love that you throw it all together and leave it to cook. The perfect weeknight meal. Love a simple one pot meal and this looks so colourful and fresh too! No more than 30 minutes from start to finish for me in the evenings. Weekends are another matter though. This is exactly the sort of thing I’d throw together. So easy. I do a similar dish, just with a tin of tomatoes and chickpeas. And there’s always leftovers for lunch the next day.